Daniel Ellsberg is a former analyst for the U.S. military and Vietnam War opponent. His name became synonymous with the importance of the press freedoms granted by the First Amendment to the U.S. Constitution after he leaked a secret report on the Vietnam War known as "the Pentagon Papers" to journalists. Ellsberg's work as a whistleblower helped exposed the failure of the government's war strategies in The New York Times, The Washington Post and more than a dozen other newspapers, and has been dramatized by Hollywood in movies such as "The Post," "The Pentagon Papers" and "The Most Dangerous Man in America." Ellsberg's leak of the Pentagon Papers helped to solidify the public's opposition to the Vietnam War and turn members of Congress against the conflict. The publication of the documents by The New York Times, The Washington Post and other newspapers helped bring about the most important legal decision in defense of press freedom in American history. When President Richard M. Nixon's administration sought to prevent The Times from reporting on the Pentagon Papers, the newspaper fought back. The U.S. Supreme Court later determined that the newspapers were acting in the public interest and restricted the government's use of "prior restraint" to censor stories before publication. Ellsberg is the author of three books, including a 2002 memoir of his work to expose the Pentagon Papers called "Secrets: A Memoir of Vietnam and the Pentagon Papers." He has also written about America's nuclear program in a 2017 book, "The Doomsday Machine: Confessions of a Nuclear War Planner," and published essays about the Vietnam War in the 1971 book "Papers on the War." 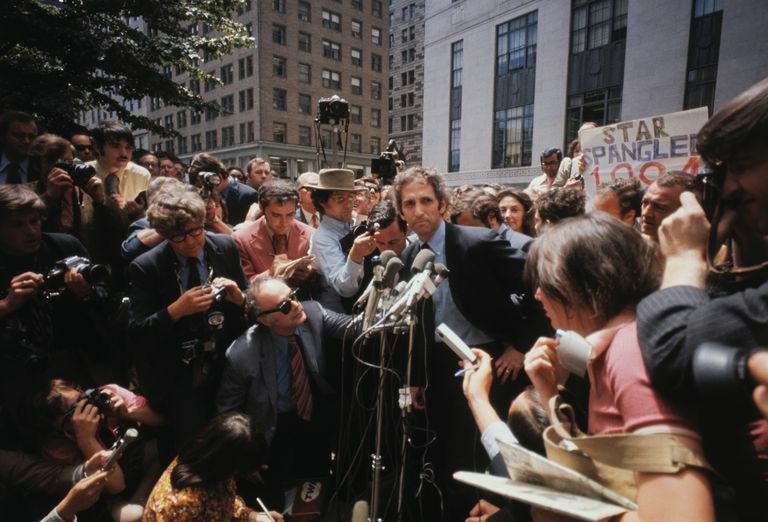 Numerous books and movies have been written and produced about Ellsberg's role in leaking the Pentagon Papers to the press and the legal battle over their publication. Ellsberg was played by Matthew Rhys in the 2017 movie "The Post." The film also featured Meryl Streep as Katherine Graham, the publisher of The Washington Post, and Tom Hanks as newspaper editor Ben Bradlee. Ellsberg was played by James Spader in the 2003 movie "The Pentagon Papers." He also appeared in a 2009 documentary, "The Most Dangerous Man in America: Daniel Ellsberg and the Pentagon Papers." The Pentagon Papers has also been the subject of numerous books, including New York Times reporter Neil Sheehan's "The Pentagon Papers: The Secret History of the Vietnam War," published in 2017; and Graham's "The Pentagon Papers: Making History at the Washington Post." Ellsberg earned a bachelor's degree in economics from Harvard University in 1952 and a Ph.D. in economics from Harvard in 1962. He also studied in the King’s College at Cambridge University. Ellsberg served in the Marine Corps before working for the RAND Corp., a research and analysis nonprofit based in Arlington, Virginia, and the U.S. Department of Defense, where he helped with the production of a report on how top U.S. officials made decisions on the country's involvement in the Vietnam Way between 1945 and 1968. The 7,000 page report, which became known as the Pentagon Papers, revealed, among other things, that the administration of President Lyndon Johnson "had systematically lied, not only to the public but also to Congress, about a subject of transcendent national interest and significance." Here's a timeline of Ellberg's military and professional career. 1954 to 1957: Ellsberg serves as a rifle platoon leader, operations officer, and rifle company commander in the U.S. Marine Corps. 1957 to 1959: Ellsberg continues his studies as a junior fellow in the Harvard University Society of Fellows, an elite program designed to allow promising young students a chance to pursue their scholarships. 1959: Ellsberg takes a position as a strategic analyst at RAND Corp. He would later write that he accepted the position "under the delusion ... that a 'missile gap' favoring the Soviets made the problem of deterring a Soviet surprise attack the overriding challenge to U.S. and world security." He worked as a consultant to the Commander-in-Chief Pacific, or CINCPAC. 1961 to 1964: As a RAND Corp. employee, Ellsberg worked as a consultant to the departments of Defense and State and to the White House. He specialized in nuclear weapons, nuclear war plans, and crisis decision-making. 1964: Ellsberg joins the Department of Defense and works for John T. McNaughton, the assistant secretary of Defense for international security affairs. In this role Ellsberg is asked to study decision-making on the Vietnam War. 1964 and 1965: Secretary of Defense Robert McNamara ordered McNaughton and Ellsberg to work on secret plans to escalate the Vietnam War. The plans were carried out in the spring of 1965. 1965 to 1967: Ellsberg transfers to the Department of State and serves in Vietnam. He is based at the embassy in Saigon. He contracted hepatitis and left Vietnam in June 1967. 1967: Ellsberg returns to work for RAND Corp. and begins work on "U.S. Decision-Making in Vietnam, 1945-68," the document that would later become known as the Pentagon Papers. 1968 and 1969: Ellsberg serves as a consultant to Henry Kissinger, the national security assistant to President-elect Richard Nixon. He helps draft Nixon's presentation to the National Security Council on the Vietnam War. 1969: Ellsberg, frustrated by what he described as a "continuous record of governmental deception and fatally unwise decision-making, cloaked by secrecy, under four presidents," learns that Nixon is preparing to escalate the nation's involved in the Vietnam War. Wrote Ellsberg years later: "The history in the Pentagon Papers offered no promise of changing this pattern from within the bureaucracy. Only a better informed Congress and public might act to avert indefinite prolongation and further escalation of the war." He begins to make photocopies of the secret 7,000 page study. 1971: Ellsberg leaks most of the report to The New York Times because Congress declined to set hearings on the study. When the attorney general and president moved to block the newspaper's publication of further reports on the Pentagon Papers, Ellsburg leaks copies to The Washington Post and 19 other newspapers. The Supreme Court later voided the injunction. But later that year, Ellsberg was indicted on 12 criminal charges related to his leak of the top-secret document. The charges included conspiracy, theft of government property, and violation of espionage statutes. 1973: The judge in Ellsberg's trial dismissed all the charges against Ellsberg, citing "improper government conduct shielded so long from public view." The judge declared a mistrial, stating that the government's action in this case "offended a sense of justice." 1975: The Vietnam War ends. Ellsberg begins a career as a lecturer, writer, and activist on what he describes as "the dangers of the nuclear era, wrongful U.S. interventions and the urgent need for patriotic whistleblowing." Ellsberg was born in Chicago, Illinois, in 1931 and was raised in Detroit, Michigan. He is married and lives in Kensington, California. He and his wife have three grown children. “Then it was as though an ax had split my head, and my heart broke open. But what had really happened was that my life had split in two.” — Ellsberg on hearing a speech by a Vietnam War resister who was about to be jailed and his decision to leak the top-secret Pentagon Papers. "That's a heavy burden to bear. I share it with a thousand others who had that kind of access." — Ellsberg on his belief that had he leaked the information sooner, Congress would not have supported an expansion of the U.S. involvement in the Vietnam War. "Had I or one of the scores of other officials who had the same high-level information acted then on our oath of office — which was not an oath to obey the president, nor to keep the secret that he was violating his own sworn obligations, but solely an oath 'to support and defend the constitution of the United States' — that terrible war might well have been averted altogether. But to hope to have that effect, we would have needed to disclose the documents when they were current, before the escalation — not five or seven, or even two, years after the fateful commitments had been made." — Ellsberg on his belief that had he leaked the information sooner, Congress would not have supported an expansion of the U.S. involvement in the Vietnam War. "Without young men going to prison for nonviolent protests against the draft, men that I met on their way to prison, no Pentagon Papers. It wouldn't have occurred to me simply to do something that would put myself in prison for the rest of my life, as I assumed that would do." — Ellsberg on his decision to risk going to prison for leaking the Pentagon Papers. "A lesson to be drawn from reading the Pentagon Papers, knowing all that followed or has come out in the years since, is this. To those in the Pentagon, state department, the White House, CIA (and their counterparts in Britain and other Nato countries) who have similar access to mine then and foreknowledge of disastrous escalations in our wars in the Middle East, I would say: Don't make my mistake. Don't do what I did. Don't wait until a new war has started in Iran, until more bombs have fallen in Afghanistan, in Pakistan, Libya, Iraq, or Yemen. Don't wait until thousands more have died, before you go to the press and to Congress to tell the truth with documents that reveal lies or crimes or internal projections of costs and dangers. Don't wait 40 years for it to be declassified, or seven years as I did for you or someone else to leak it." — Ellsberg on the importance of whistleblowers to democracy. "The personal risks are great. But a war's worth of lives might be saved." — Ellsberg on the important of transparency in government. "I am a patriot, and that has never changed." — Ellsberg responding to a question from National Public Radio about his patriotism and belief in the strength of the United States.